True Source Daily Multivitamin Packs are whole food vitamin and mineral supplements with phytonutrients and antioxidant benefits. Each multivitamin pack supplies a natural wide spectrum of what you want and need in a multivitamin - B Vitamins, Vitamins A, C, D, E and K, folic acid, selenium, zinc, potassium, iodine and magnesium. It also contains NingXia Wolfberries which have vital natural minerals, vitamins and antioxidants required to support a healthy lifestyle regimen. Each capsule has different ingredients that are grouped by color which is designed to support various healthy systems in the body. They are formulated to provide a foundation for a healthy lifestyle regimen and energize the body. True Source protects by providing vital nutrients and antioxidants. It supports by providing the correct amount of calcium, magnesium, vitamin D and MSM; and they energize by delivering vitamins and nutrients that sustain energy and support a healthy immune system such as Vitamin B and spirulina. To support your wellness goals, include a probiotic, Omega-Gize3 and digestive enzyme in addition to True Source as part of a core foundational nutritional program. This is an easy reference guide for True Source Daily Multivitamin Packs with Benefits of Wolfberry. It will tell you how to use it and what to use it for! Want to Purchase True Source Daily Multivitamin Packs? What is in True Source Daily Multivitamin Packs? True Source Green: Vitamin A (as alpha and beta carotene), vitamin C (as ascorbic acid), vitamin D (as cholecalciferol), vitamin E (as mixed tocopherols), vitamin K (as phytonadione), thiamin (Vitamin B1 as mononitrate), riboflavin (vitamin B2), niacin (as niacinamide) (vitamin B3), vitamin B6 (as pyridoxine HCI), vitamin B6 (as pyridoxal-5-phosphate), folate (as folic acid), vitamin B12 (as methylcobalamin), biotin (as biotin yeast), pantothenic acid (as calcium pantothenate), iodine (as potassium iodide), magnesium (as magnesium oxide), zinc (from zinc yeast complex), selenium (from selenium yeast complex), copper (from copper yeast complex), chromium (from chromium yeast complex), broccoli (brassica oleracea) aerial parts, spirulina (spirulina platensis) algae, chlorella algae, barley grass, orange (citrus sinensis) fruit, MSM (methylsulfonylmethane), olive (olea europaea) leaf extract, NingXia wolfberry (lyceum barbarum) fruit polysaccharides, l-leucine, tocotrienols (from natural palm oil), coral calcium, boron (as boron AAC), lutein (from marigold flowers). True Source Purple: Vitamin A (as alpha and beta carotene), vitamin C (as ascorbic acid), vitamin D (as cholecalciferol), vitamin E (as mixed tocopherols), vitamin K (as phytonadione), thiamin (Vitamin B1 as mononitrate), riboflavin (vitamin B2), niacin (as niacinamide) (vitamin B3), vitamin B6 (as pyridoxine HCI), vitamin B6 (as pyridoxal-5-phosphate), folate (as folic acid), vitamin B12 (as methylcobalamin), biotin (as biotin yeast), pantothenic acid (as calcium pantothenate), iodine (as potassium iodide), magnesium (as magnesium oxide), zinc (from zinc yeast complex), selenium (from selenium yeast complex), copper (from copper yeast complex), chromium (from chromium yeast complex), broccoli (brassica oleracea) aerial parts, pomegranate (40% ellagic acid), grape (vitis vinifera) skin extract, resveratrol (from polygonum cuspidatum), orange (citrus sinensis) fruit, MSM (methylsulfonylmethane), olive (olea europaea) leaf extract, NingXia wolfberry (lyceum barbarum) fruit polysaccharides, l-leucine, citrus flavonoids (from tangerine extract), tocotrienols (from natural palm oil) , boron (as boron AAC), lutein (from marigold flowers). True Source Yellow: Vitamin A (as alpha and beta carotene), vitamin C (as ascorbic acid), vitamin D (as cholecalciferol), vitamin E (as mixed tocopherols), vitamin K (as phytonadione), thiamin (Vitamin B1 as mononitrate), riboflavin (vitamin B2), niacin (as niacinamide) (vitamin B3), vitamin B6 (as pyridoxine HCI), vitamin B6 (as pyridoxal-5-phosphate), folate (as folic acid), vitamin B12 (as methylcobalamin), biotin (as biotin yeast), pantothenic acid (as calcium pantothenate), iodine (as potassium iodide), magnesium (as magnesium oxide), zinc (from zinc yeast complex), selenium (from selenium yeast complex), copper (from copper yeast complex), chromium (from chromium yeast complex), lecithin (choline), barley grass, orange (citrus sinensis) fruit, curcumin (root and rhizome) extract, MSM (methylsulfonylmethane), olive (olea europaea) leaf extract, NingXia wolfberry (lyceum barbarum) fruit polysaccharides, l-leucine, citrus flavonoids (from tangerine extract), tocotrienols (from natural palm oil), boron (as boron AAC), lutein (from marigold flowers). 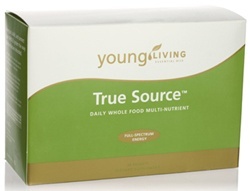 What are the Documented Uses for True Source Daily Multivitamin Packs? To support a healthy lifestyle regimen take a daily multivitamin. How do I use True Source Daily Multivitamin Packs? Take 1 pack of one of each color capsule daily. Capsules can be taken separately or combined together in 1 daily dose. Can this Product be used for Animals? Yes, animals can ingest these! Birds up to 1/4 to 1/2 capsule total volume based on using all 3 capsules/day. Cats and small dogs 1 capsule total per day. Medium and large dogs use about 1 capsule per 30 pounds (14 kg) of body weight per day. Horses up to 2 packages per day. What are the Safety Precautions? Do not exceed recommended dosage. Keep in a cool place away from excessive heat or direct sunlight.